Are you tired of always being Mario in Super Mario Brothers? Well, by reading this guide, you can learn how to dress up as Luigi, instead of always being Mario. Wear a green cap, make a white semi-circle of out a cloth, put it on the front of the cap, and put a green "L" on it. Wear a green long-sleeve shirt. Wear a fake mustache. Handlebar mustache works best. 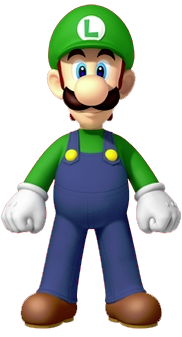 If you want to be the NES Super Mario Brothers (original) Luigi, then get a white cap, green shirt, and white dungarees. To be the Mario Bros. Luigi, then get a brown shirt and green overalls. People may make fun of you, but don't be intimidated. This is just for fun!